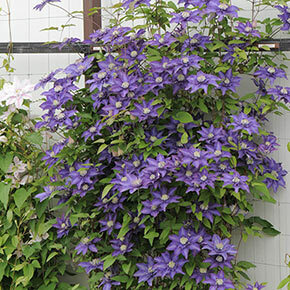 Multi Blue Clematis is in the YELLOW pruning category. 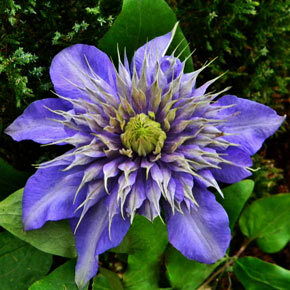 It blooms best on old wood, but it can also bloom on new wood. Use caution when pruning to retain healthy stems from last season for best flowering. See our Stoplight Pruning Guide for more information. Winter Care: Winter mulch around the base of the plant. 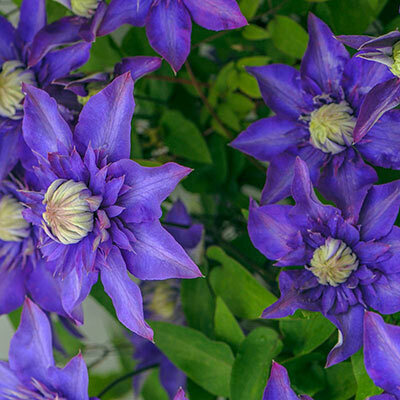 Flower Form: Double ring of sepals 3"- 5" flowers. 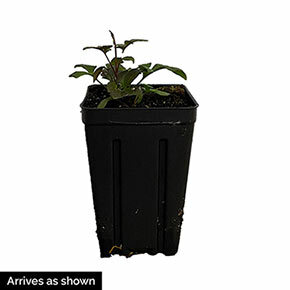 Foliage Type: Opposite compound dark green in spring and summer, yellow in fall. Leaflets lanceolate to ovate 1-2" long. Bronze colored when young. Pruning Time: Only after blossoming prune lightly and not too frequently. Soil Requirement: Humus rich, well-drained, alkaline soil. Additional Information: Climb by attaching leaf stalks about the means of support.